We’re so grateful that the Durham Co-op Market was able to develop a unique solution to using GreenToGo reusable takeout containers for to-go salad/hot bar purchases! A food bar layout creates challenges that we hadn’t yet experienced with other restaurants. It’s a simple solution really; GreenToGo containers are kept at the Deli counter, just behind the food bar. 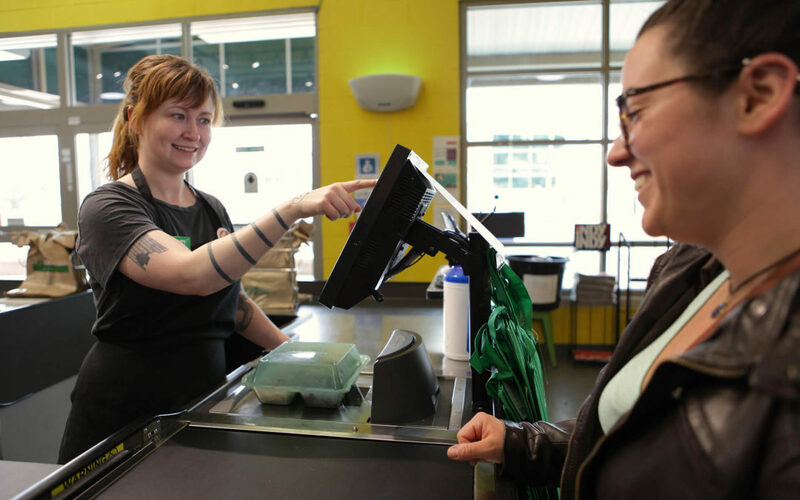 There are always Durham Co-op Market team members behind that counter, so they can verify that you’re an active GreenToGo member and give you the box to use for your delicious food on the go! Step 1: Login to your GreenToGo account on your phone so that the “Active Member” page is present, and head on over to the Deli Counter to request a GreenToGo box while showing them your “Active Member” screen. Step 2 Option 1: The easiest way to check out your box is to use a QR code reader (that you already downloaded on your phone). Just scan the code provided. That will take you directly to the GreenToGo checkout page. Step 2 Option 2: You can also go to app.durhamgreentogo.com/locations in Safari or Chrome and enter the “Location Code” provided on the sheet at the Deli Counter. 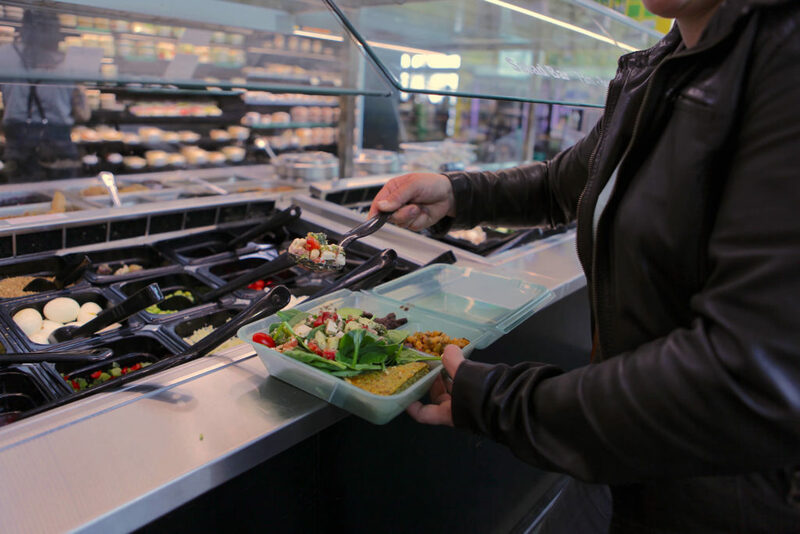 Step 3: Bring your GreenToGo container over to the food bar, and fill up your box. Or, use your GreenToGo box at the deli counter if you’re purchasing a sandwich. Step 4: Now head over to the checkout lines with your GreenToGo meal. The cashiers have the tare information to deduct the weight of the container from the total weight (there is a Green2Go button on the registers just for us). They’ll ring you up just like any other purchase! Step 5: Enjoy your food at home, at the office, at the park – anywhere! When the container is empty, just give it a quick rinse (but no need to scrub it)! Step 6: Return the container to any GreenToGo return station (at any participating restaurants, the Scrap Exchangeand Fullsteam Brewery) and check it in by either scanning the QR code on the return station, or logging into app.durhamgreentogo.com/locations and entering the Location Code on the return station. 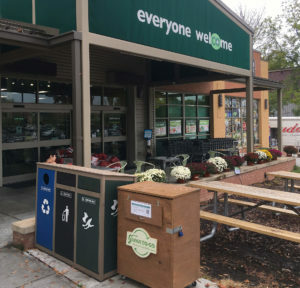 Note: the return station at Durham Co-op Market is located in front of the building, next to the other waste disposal containers, as shown below.